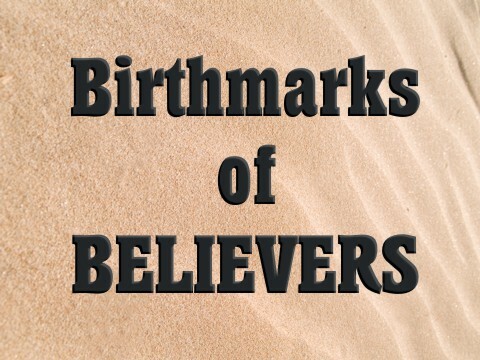 What are some of the birthmarks that believers ought to bear? Not every Christian will bear the same birthmarks as you or me. Some will show them more profoundly than others. Some will have fewer and others have more, but not everyone displays these birthmarks right away. After a person is born again, or as the Greek indicates, born from above (John 3:3-8), a spiritual babe in Christ feeds on the milk of the Word, like understanding repentance and Who the source of it is, why we need to be baptized once we’re saved, what it means to put your trust in Christ, and other such essentials that are elementary, but critical biblical truths. It also takes time for a Christian to become more Christ-like. Each individual differs from another, so some people can stop drinking or smoking cold turkey while others battle this temptation all their lives. Thankfully, we’re not left to our own strength. We can only do anything through Christ (Phil 4:13) but certainly nothing without Him (John 15:5), so the point is we cannot judge other Christians over non-essential things in their life but also what we might think is sin, but it’s not yet been revealed as sin to them. That’s the Spirit’s job, and I found out that I make a poor imitation of the Holy Spirit in trying to convict people of what I think is sin to me and should be to them. I have matured some (hopefully), so we need to have patience with one another and let God’s Spirit work in their lives and in His time, not ours. Jesus expects us to do more than the world. For example, we are not to seek revenge but trust God to execute justice, and it might not be today, but we’re also told to pray for our enemies and do good to those who do bad to us. That’s a high watermark for the Christian, but we can’t do this in our own strength. Jesus said that others will know we are His disciples if we love one another (John 13:34-55). In fact, it’s commanded. The “others” Jesus was speaking about wasn’t just the church. I think Jesus was telling us that if we love one another like He loves us, it would be obvious to all people (saved and lost) that we are His disciples, because the world doesn’t love like that, and perhaps too few Christians love like that (Read Phil 2:3-8). Jesus expected us to pray for our enemies, bless them that curse us, and do good to them that persecute us (Matt 5), since He died for us while we were still ungodly, wicked sinners who were His enemy (Rom 5:6-10). Pray for God to bless your enemies and to save your enemies and you will be surprised by joy! If someone is saved, they won’t live like the unsaved. This doesn’t mean they won’t sin, because we all do (1st John 1:8, 10), but “No one born of God makes a practice of sinning, for God’s seed abides in him; and he cannot keep on sinning, because he has been born of God” (1st John 3:9). If you love sports, you probably practice, so the word “practice” that John uses is important. It means there is an ongoing repetition or practice of something, and in this case, it’s sin. No child of God makes a practice of sinning because the seed of God (the Holy Spirit) would convict him if he or she does keep on sinning. We might sin, but we don’t enjoy it like we used to because He is convicting us of it…and that’s a good thing, but if there is no conviction, and there is an ongoing practice of sinning, it is time to examine oneself to see if they’re really in the faith (2nd Cor 13:5). Imagine you have the cure to cancer but you are embarrassed to bring it up in public, however three of your friends or co-workers have cancer, and instead of speaking up and potentially saving their life, you keep it to yourself, and in time they die without the cure. Now, in an even more profound way, we have the pearl of great price…the gospel of Jesus Christ, and yet few are willing to enter into the fields to labor for the Lord. That’s why Jesus told the disciples to pray for more laborers, because He knew there’d be a shortage (Matt 9:38). If you passed by a burning house without calling 911 or trying to warn the family, that’d be criminal negligence, so how much more serious is the fire that is coming (Rev 21:8). Do we even care enough to be embarrassed for His name’s sake and for their eternal destiny? What joy there is in soul-winning, acknowledging the fact that God alone saved, but He does use us as a means, and what a great privilege. Jesus told His disciples that they must abide in Him so that He can abide in them. It is a mutual relationship where Christ lives in us and we abide in Him. The Apostle John wrote “Every branch in me that does not bear fruit he takes away, and every branch that does bear fruit he prunes, that it may bear more fruit’ (John 15:2), and “Abide in me, and I in you. As the branch cannot bear fruit by itself, unless it abides in the vine, neither can you, unless you abide in me” (John 15:4). A dead branch, which is dead because it’s not attached to the vine, will not produce fruit, so none of us can produce fruit outside of God’s help and by His Spirit. How much can we do in our own strength? Jesus says, “I am the vine; you are the branches. Whoever abides in me and I in him, he it is that bears much fruit, for apart from me you can do nothing” (John 15:5). Apart from the vine we can produce nothing and that’s not a little something. It is only with Him can we bear fruit…and not wax fruit, but the real thing. The fruit is evidence of the root, for if there is no fruit, you can be sure, there is no root. I don’t know of any Christian that lives all of these out perfectly, with a few exceptions, like the Apostle Paul, and Dietrich Bonhoeffer, who not only wrote a book on being a disciple of Jesus, but lived it out until his execution. Please don’t use these Christian attributes as a means to measure the spirituality of others, but as a self-examination diagnostic tool which is what the Word of God actually is. We examine it, but it examines us and finds us all wanting. We only have control over who we see in the mirror. God controls the rest, both the saved and the unsaved (Prov 21:1). They will stand before God and give an account and I won’t expect them to give an account according to any man made list, but let’s take to heart Paul’s exhortation to examine ourselves to see if we are in the faith, lest we examine others and take the place where God sits and that is on His judgment seat, not ours. This I speak to myself for I am in no way better. Here is a great related article: How Do You Know They are Christian? Oh my, that was spectacular! So perfectly spoken. Thank you for this one. So touchingly beautiful! God’s blessings to you. Thank you kindly Kathy. This is of course all from God, because I can’t do anything without Him (Psalm 115:1; John 15:5; 1 Cor 4:7), but thank you for the encouragement. Previous post: How Can A Christian Glorify God At Work? Next post: What Are Three Things God Wants Us to Lust After?